When I caught up with New Found Glory’s Steve Klein, he had just got off the road from a co-headline tour with Alkaline Trio. “It’s really nice to enjoy some down time at home,” Klein said. “I’m living in central California at the moment, about two hours north of LA. The band has drawn many comparisons to Blink 182 over the years, something Klein didn’t dismiss. “We’re the same genre of music, we’ve toured with them, we had the same manager as them for a number of years,” Klein said. “If people wanna say to their friend, ‘Oh hey, you like Blink, you should check out New Found Glory,’ then hey, that’s not a bad thing, you know? Klein was a founding member of the band, alongside lead vocalist Jordan Pundik. “He (Jordan) was a friend of mine from high school, we were both working at Red Lobster and started talking about making a band,” he said. The band’s original drummer, Joe Marino, “played like two shows” with the band before they recruited current drummer Cyrus Bolooki. From their debut EP It’s All About The Girls, recorded in a friend’s apartment, the band’s success took off – something none of them had expected, said Klein. “We never expected any kind of success from what we were doing,” he said. Klein said some of his surprise in the band’s success came from his earlier, ‘underground’ influences. “I listened to a lot of ’90s alternative, emo stuff,” he said. “Bands like Mineral, Jawbreaker, The Get Up Kids, Lifetime… bands a lot of people these days probably wouldn’t have heard of. “I can tell you as one of the songwriters, New Found Glory is all about writing real life and putting it to music. The band released a live album, Kill It Live, to coincide with the American tour with Alkaline Trio. “I guess it was just something we had to tick off the list,” Klein said. “We’d never had a live record before, and we’ve been a band for 16 years now. “Right now we’re in between albums, we’ll probably release something new in the next year or so, but there are three brand new songs on the live record. “It’s all about timing for us, we like to keep our fans happy and the feedback we were getting was that they wanted something new, so… they kind of got it. New Found Glory is headlining the much-anticipated Vans Warped Tour return to Australian shores, something Klein said the band was more than happy about. “This will be the sixth or seventh time we’ll have been to Australia,” he said. “I think we first came out there in 2001 and we’ve been every two years since – we actually did the last Warped tour as well. “This one is going to be a lot of fun, but very different from last time… before Soundwave we all used to tour in Greyhound buses. “Imagine us, The Mighty Might Bosstones, The Vandals, all of the bands together on a bunch of buses… that’s how different touring is now. “I don’t think the crazy hangouts and parties will be any different, though. 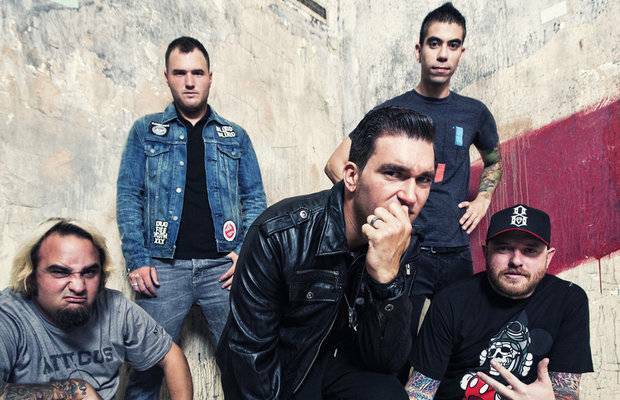 New Found Glory will headline Vans Warped Tour Australia. For more information visit the official web site.